This reminds me of the White cop who allegedly entered an apartment she claimed she truly thought to be hers, only to gun down the actual owner inside, a black male. She claimed he disobeyed warnings....in his own home. Funny how Naomi is depicted as White in cartoons. It's cartoon. Isn't "White" considered "pure" in literature? Aren't all angels depicted as White? That may not be true but it's the world we live in. Naomi was pure, classy, respectful. So yes, he drew her as white. It's a cartoon people. it draws feelings and emotion. I'll call this guy a racist when you show me his previous racist work. He could have drawn Naomi all White.. White outfit, white hair, white racquet, white shoes, etc ... He could have drawn her looking like an angel, and people would still have issues with it. I have no problem with whatever is coming out of this. Serena is a veteran player who should know when to stop, like her mom said. I hope she sits her down like a 2-year old and tells her. We don't want to see this again. Enough ammunition for the haters. Last edited by Ace2Ace on Sep Tue 11, 2018 12:13 pm, edited 4 times in total. Serena should try to play tennis matches without abusing umpires no matter the call. That's all there is to it. It's human to react to a call. I have no issue with that. But you got to know when to stop. Last edited by Ace2Ace on Sep Tue 11, 2018 12:04 pm, edited 1 time in total. so was surprised a point was deducted for racquet abuse. Lost her cool as a result. as it is not something she resorts to & may have been completely unaware he was doing so. IMO coach and her do not seem to be on the same page always. rules are applied aribtrarily and selectively. Serena has been on the tour for 20+ years. When is the last time a ref retracted a warning? Last edited by Ace2Ace on Sep Tue 11, 2018 12:18 pm, edited 1 time in total. 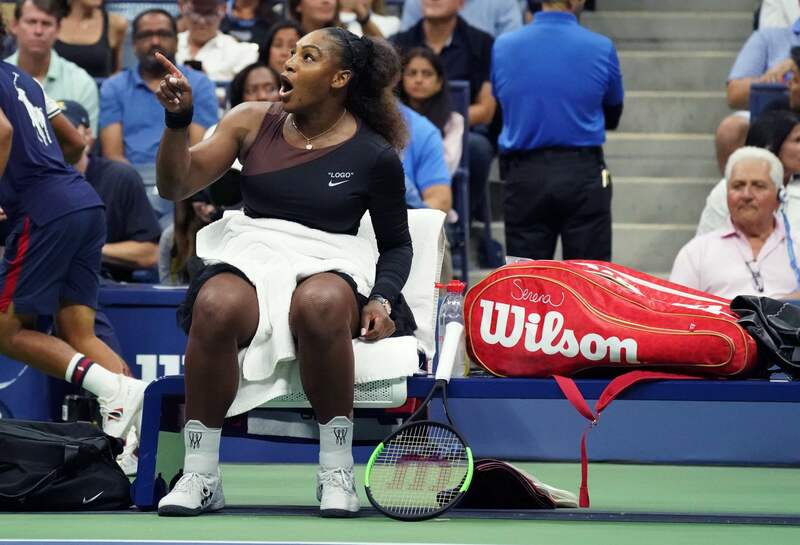 Chair could have ushered a warning before deducting a game.#ed_op#br#ed_cl#Not defending Serena's behavior - but not defending chair altogether either. #ed_op#br#ed_cl#It takes two and director could have intervened as all saw what was happening.#ed_op#br#ed_cl##ed_op#br#ed_cl#BTW many players from Nadal, Venus, Federer, Murray, Djoko have complained to this chair during matches and/or after -#ed_op#br#ed_cl#I think Nadal refuses to have him umpire his matches. Last edited by CrossCourtBH on Sep Tue 11, 2018 12:38 pm, edited 1 time in total. Who can actually hear and distinguish verbal coaching in Arthur Ashe and make sense of it? It's not like the hand signals from Maria's and Juicy's coaches. And what could they entail? "Hit to her bh." Really? There are only 2 choices, it's either the bh or fh. Plus wouldn't Naomi hear that also and adjust, assuming she wouldn't have thought the suggestion had come from her own coach? They complain because he is one of the very few refs that is not afraid of applying the rules. 2nd warning, you lose a point. 3rd warning, you lose a game. 4th warning, you lose the match. People who know him argue with him on that first warning, and they stop. Because they know he WILL apply the rules. If BJ. King and WTA don't like the rules, they should take them off the book. They shouldn't blame the umpire for applying them. Last edited by Ace2Ace on Sep Tue 11, 2018 12:25 pm, edited 1 time in total. Who can actually hear and distinguish verbal coaching in Arthur Ashe and make sense of it? What nth excuse are you coming up with? No one said there was verbal coaching. Were you watching the match? Last edited by Ace2Ace on Sep Tue 11, 2018 12:49 pm, edited 1 time in total. It's time for a research of conflicts between male players and umps and it's not hard to do given YouTube etc. Countless times players have insulted and berated the umps as incompetent and useless yet they just sit there like fanboys. And he who can do no wrong Federer is part of that group. Last edited by CrossCourtBH on Sep Tue 11, 2018 12:41 pm, edited 2 times in total. Already replied to this argument. It depends on when the players do it. You don't get points taken off if it's the first offense. You get a warning. If you are smart, you stop so you don't get 2nd, 3rd, 4th warning. When SErena starts berating refs, it's non-stop. At every change-over, she thinks she has the right to argue with him. She is lucky I am not an umpire. lol lol lol lol. I'd throw the book at her every time. This ref was very patient. Last edited by Ace2Ace on Sep Tue 11, 2018 1:04 pm, edited 3 times in total. This was regrettable - and Serena probably regrets it too. I am left with unanswered questions. This incident I feel does not and should not define Serena and her career (though during the match and now there are consequences). She did try on the podium to salvage things & under the circumstances that was commendable.